> Humankind has been damaging the seas for decades by discharging pollutants into the water, destroying coastal ecosystems and overexploiting fish stocks. Ocean warming and ocean acidification are new global-scale threats affecting the seas today. A precondition for sustainable ocean use will be an exact analysis of its con­di­tion so as to allow for the correct environmental policy measures to be taken from now on. Be it overfishing, marine pollution, ocean warming or acidification – today the oceans and the ecosystem services they provide are under more serious threat than ever before. The many problems caused by either regional mismanagement or global climate change render marine protection a particular challenge, which can only be met by a multitude of individual measures. Coastal regions are acutely affected as they are par-ticularly densely populated and coastal seas are subject to intensive use. The bulk of fish are taken from coastal waters which are, moreover, the focus of drilling for natural gas and crude oil as well as intensive shipping transport. Tourism is another particular threat to coastal areas. Many coastal regions are popular holiday destinations, which often results in natural areas in these regions being destroyed for the sake of constructing hotel complexes. 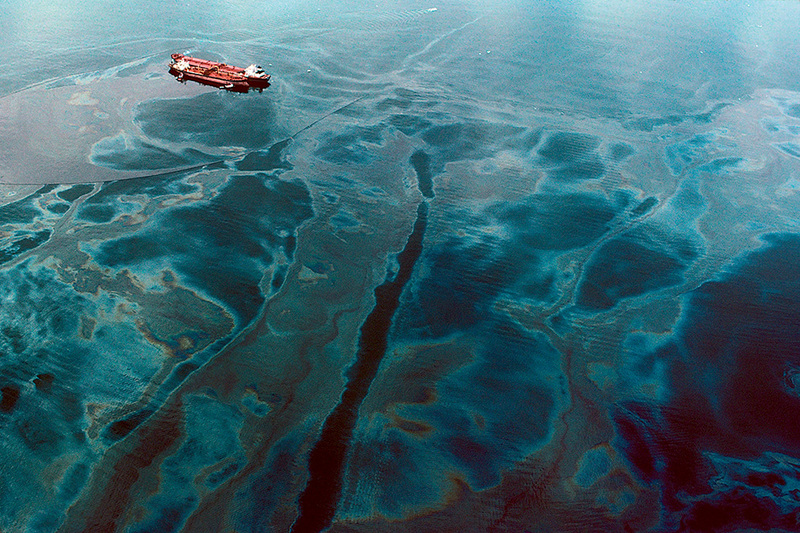 2.14 > When in 1989 the oil tanker Exxon Valdez ran aground near Alaska, the oil eventually covered 2000 kilo­me­tres of coastline. Several nature reserves and protected areas for birds are located in the area. Ocean noise pollution from shipping and from the growing offshore industry (exploitation of oil and natural gas reserves, construction of wind turbines, future mineral extraction). (release of nutrients, pharmaceuticals and pathogens). WOR 2 - Plenty more fish in the sea? Destruction of coral reefs as a result of fishing or tourism. 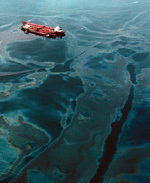 as a result of shipping transport or shellfish farming; changes in characteristic habitats. 2.15 > Oceans are also affected by noise pollution. In 2014, French scientists for the first time produced a map depicting noise pollution in the Strait of Gibraltar which is subject to high levels of shipping traffic. The depth of the red colour indicates the noise level – the deeper the colour, the noisier the area. These threats have not diminished in recent year. One exception is oil pollution where changes for the better are evident: There has been a decrease in the amount of oil entering the oceans. Moreover, in Western Europe fewer nutrients are reaching the North Sea. However, for most of the other pressures there is no sign of a reversal of trends. Quite to the contrary, the threats are actually increasing. Many scientists take the view that ocean warming and ocean acidification, two of the effects of climate change, are having a global impact on the oceans. The cause of seawater becoming more acidic is the increase in atmospheric carbon dioxide (CO2), some of which enters the ocean, thus increasing dissolved CO2 in the seawater which leads, simply put, to the formation of carbonic acid. Laboratory experiments have shown that more acidic water renders calcium carbonate (CaCO3) structures of oceanic calcifying organisms, such as corals, bivalves, molluscs and sea urchins, more vulnerable to dissolution. There are a number of naturally occurring forms of CaCO3 which differ minimally in their chemical composition, such as aragonite and calcite, two forms of CaCO3 used by a range of marine organisms at different proportions to construct their shells or exoskeletons. 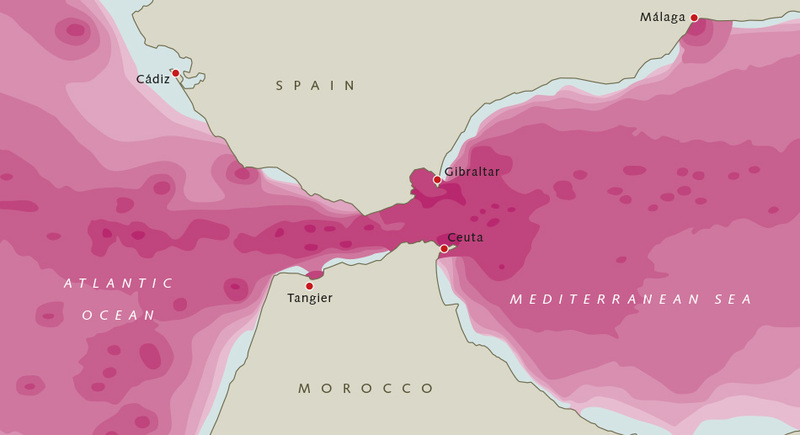 The experiments have shown that those animal species which primarily use aragonite are likely to be the first to be most strongly affected by ocean acidification. 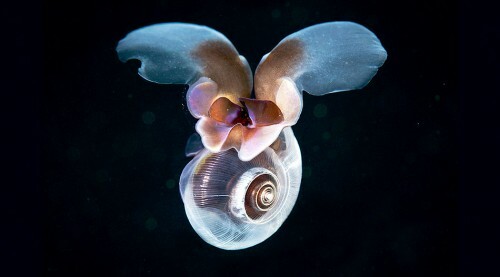 In particular, the zooplanktonic pteropods may be affected in the future; these are pea-sized “wing-footed” free-swimming sea snails. Pteropods are an important food source of fish as well as whales. Their aragonitic shells are particularly delicate and marine scientists are concerned that these shells may dissolve very quickly. Studies have shown that ocean acidification is a threat even to their offspring which may perish during their growth phase. But the shells of adult pteropods also dissolve over time. 2.16 > The pteropods’ thin and fragile calcified shells may dissolve as a result of ocean acidification. As gases such as CO2 dissolve more readily in cold water, ocean acidification proceeds most rapidly in the colder waters of higher latitudes. In cold waters, marine scientists are already seeing the first signs of the critical point slowly being exceeded at which aragonite is beginning to dissolve. For example, on expeditions conducted by the United States National Oceanic and Atmospheric Administration (NOAA) in the Pacific Ocean off the northern U.S. states of Washington and Oregon, numerous adult pteropods were caught the shells of which displayed clear signs of corrosion. The ongoing process of ocean acidiﬁcation also impacts on animal behaviour. Scientists have found that the Atlantic king scallop loses its ability to escape from predators. Normally the animals’ escape strategy involves fast shell closure and jet-like propulsion enabling them to swim out of the danger zone. With increasing acidification, however, this clapping performance weakens, thus compromising their ability to escape from predators. What is worrying is that the two phenomena of ocean acidification and ocean warming can amplify each other. Laboratory experiments conducted by ecophysiologists studying animal metabolism have shown that some crustaceans and fish have a shortened lifespan if the water becomes both warmer and more acidic at the same time. While not all marine regions are threatened by the same environmental problems, coastal regions in particular, counting amongst the world’s most densely populated areas, tend to be affected by a multitude of problems at the same time. Comprehensive marine protection in these regions would benefit a huge number of people. The United Nations estimate that today more than 40 per cent of the world’s population, i.e. more than 2.8 billion people, live within 100 kilometres of the coast. Thirteen of the world’s 20 megacities containing 10 million or more people lie along coasts. These include the cities or conurbations of Beijing (14.3), Calcutta (14.3), Dhaka (14.4), Istanbul (14.4) and Mumbai (18.2). 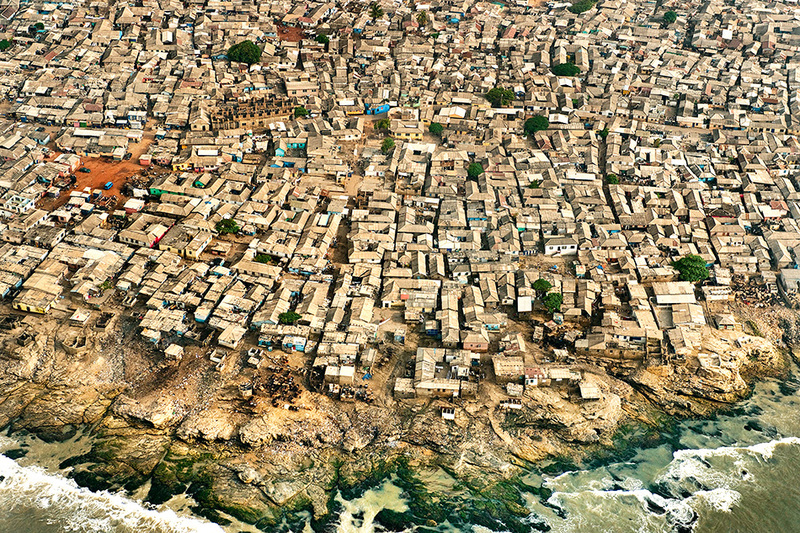 Experts expect further increases in the urbanization of coastal areas over the coming years. They anticipate, for example, that in West Africa the 500 kilometres of already densely populated coastline between Ghana’s capital Accra and the Niger delta in Nigeria will become a continuous urban megalopolis of more than 50 million inhabitants by 2020. The state of the coastal seas is dependent on both the activities taking place directly on the coast and on impacts exerted by the coastal hinterland. Some problems arise directly on the coastline, such as untreated effluent dis-charge or the destruction of the coastal strip as a result of building construction. But in many regions, large quanti-ties of pollutants also arise in the hinterland, reaching the coast via rivers or the air to be discharged into the coastal seas. These pollutants may originate far inland. The chemically highly stable fluoropolymers, for example, which are used for the production of outdoor jackets as well as grease, dirt and water-repellent paper, are released into the atmosphere from factory chimneys and travel thousands of kilometres into far distant regions. Similarly, the journey of sewage or industrial effluent contaminated with heavy metals often begins far inland. Experts estimate that land-based sources now account for 80 per cent of marine pollution including fertilizers. It is in fact very difficult to define a clear boundary between the coast and its hinterland – where does one end and the other begin? Indeed, there is no universal definition of the term “coast”. Scientists in different fields use different criteria of relevance in this respect. Geologists may look at sediment transport from the mountains or the hinterland into coastal waters, whereas botanists researching salt marsh vegetation might have a more narrow definition of what constitutes the coast. 2.17 > A slum in Ghana’s capital Accra. The 500 kilometres of coastline between Ghana’s capital Accra and the Niger delta in Nigeria is expected to become a continuous urban megalopolis of more than 50 million inhabitants by 2020. In regions that are subject to intensive agricultural practices, a lot of nutrients enter the soil. These nutrients are landspread in the form of chemical fertilizers or slurry from livestock production units. Moreover, municipalities may discharge similarly nutrient-rich untreated wastewater and, in particular, excrements. By way of streams and rivers or the sewage system, excess nutrients are transported all the way to the sea. Phosphorus and nitrogen compounds in particular encourage strong algal growth, resulting in algal blooms. Ultimately, oxygen-consuming bacteria decompose dead algae. The more algae are present, the more intensive the process of bacterial degradation and the greater the oxygen demand. In extreme cases anoxic zones may result in which fish, crustaceans or bivalves can no longer survive. 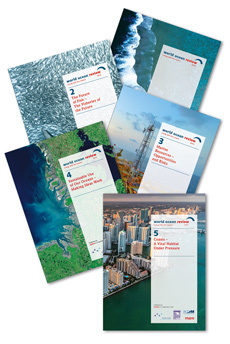 Examples of highly eutrophied marine areas are the Mississippi Delta at the Gulf of Mexico or the Yellow Sea on China’s east coast. 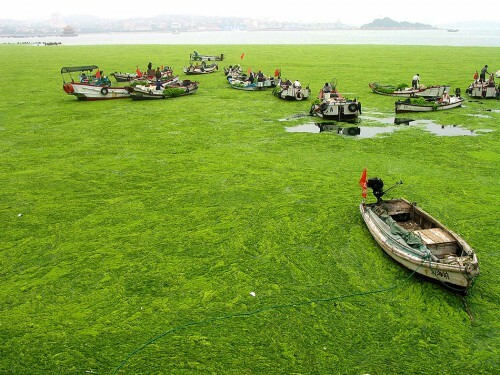 2.18 > Algal bloom at the Chinese coastal city of Qingdao. Helpers use fishing boats to gather up the thick green mass. Algal blooms have been occurring in the region for about the past decade. Scientists blame high levels of nutrient deposition into the sea. Owing to high levels of nutrient runoff from agriculture carried by the Mississippi River, a “dead zone” has developed in recent years off the U.S. state of Louisiana, reaching a size of up to 20 000 square kilometres. In the Yellow Sea which is located between mainland China and the Korean Peninsula, massive algal blooms have become an annual occurrence since 2007. Each summer the seaweed Ulva prolifera produces a thick green floating carpet on the water surface. In the summer of 2008, the algal carpet reached an unprecedented size, swathing approximately 1200 square kilometres – twice the extent of Lake Geneva. At the height of the summer season and during the Olympic sailing events, the algal carpet floated to the Chinese urban centre of Qingdao. City officials had to remove about one million tonnes of biomass from the local beaches alone. In a recent study, Chinese scientists concluded that the amount of nutrients discharged into the Chinese coastal waters of the Yellow Sea had increased by an average of 45 per cent in the 2007 to 2012 period compared to the years 2001 to 2006.